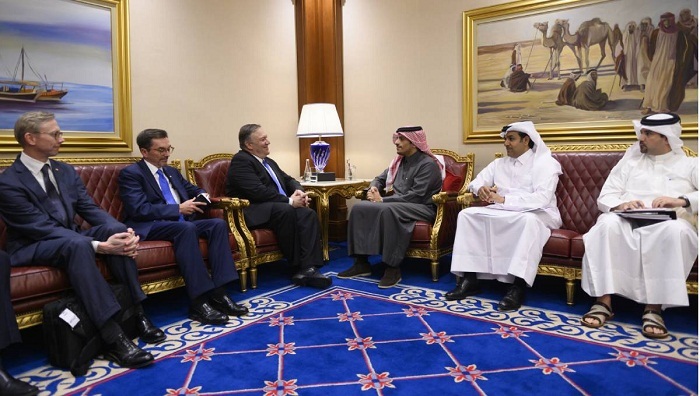 U.S. Secretary of State Mike Pompeo was in Saudi Arabia for talks Monday on a range of Mideast crises, topped by the conflicts in Syria and Yemen, threats from Iran and the Saudi response to the killing of Washington Post columnist Jamal Khashoggi last year. Speaking with senior Saudi officials on his arrival in Riyadh late Sunday, Pompeo stressed the importance of supporting a political solution to end Yemen's civil war and "the need for continued regional efforts to stand against the Iranian regime's malign activity and to advance peace, prosperity, and security," the State Department said. The department said Pompeo also made clear the importance of a credible investigation into Khashoggi's killing at the Saudi Consulate in Istanbul in October. Pompeo "emphasized the importance of Saudi Arabia continuing its investigation into the murder of Jamal Khashoggi in order to ascertain facts, assess information, and hold those responsible accountable." "It's on everyone's mind and not at all clear that the rift is any closer to being resolved today than it was yesterday - and I regret that," Pompeo said.